Photo: John J. Homestead, ca. 1787, Jay Street (State Route 22), Katonah, NY. 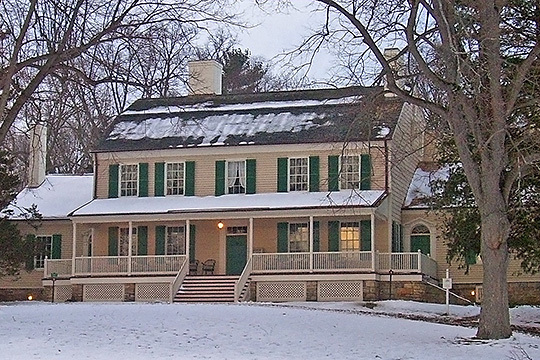 The house is alternatively known as the Bedford House or John Jay House. Home of John Jay, first Chief Justice of the U.S. Supreme Court. Listed on the National Register of Historic Places in 1972 and dedicated as a National Historic Landmark in 1981. Photographed by User:Daniel Case (own work), 2007, [cc-by-3.0 (creativecommons.org/licenses/by/3.0)], via Wikimedia Commons, accessed September, 2013. County government offices are located at 148 Martine Avenue, White Plains, NY 10601; phone: 914-995-8353. Formed in 1683, Westchester is one of the 12 original New York counties. County Seat is White Plains City. In 1912 the county was truncated having given up the area that is now Bronx County. Westchester is more than 450 square miles of, largely, rolling hills. Three main streams flow through the county: Bronx, Croton and Saw Mill rivers. According to the county's website it is one of the most-heavily forested in New York State. The Hudson River forms the county's western boundary. A portion, to the southeast, borders Long Island Sound.